Six months from now they probably want to show another hockey stick, with today as the inflection point, and it will plot visits or views again. This is what they call mainstreaming. What's impressive is how Twitter pulled together their most significant upgrade. And if the goal was expressed in numbers it would be for mainstream growth. But a word of caution. Mainstreaming was the thing that Yahoo thought they did best, the core of their initial achievement. But as 2.0 came along the Mainstreaming legacy groups, culture and processes kept them from adapting. 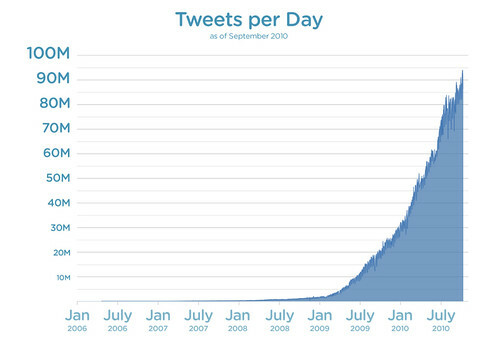 If Twitter succeeds, they need to be wary of the kind of success that can come from growth. And I hope they do, because this is still just the beginning. P.S. : This post is really just about the obvious, while I'm waiting to actually play with it. DailyEndeavor, the job guide written by regular people (I'm one of them and an Advisor), just opened up three new job review categories: Management Consulting Jobs, Banking & Finance Jobs and Law Jobs. If you are a lawyer, consultant or budding tycoon please go share your experience for job seekers to understand what's out there and what job they would really love. If you can't find the job review you are looking for, you can post a brief request. Other categories include Education Jobs, Human Rights Jobs & Microfinance Jobs with more on the way.